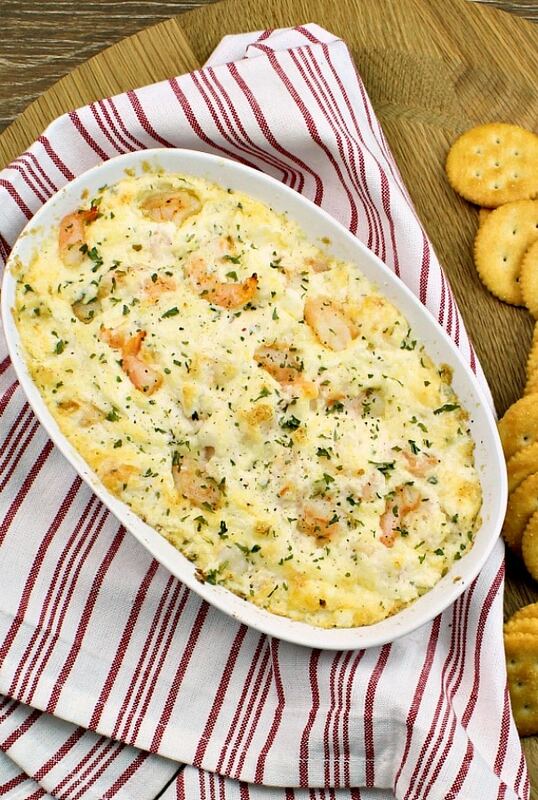 This recipe for Baked Shrimp Dip will make you the hero of any party or game day. Made with savory shrimp, cream cheese, mozzarella, and parmesan cheese this recipe is always a crown pleaser! 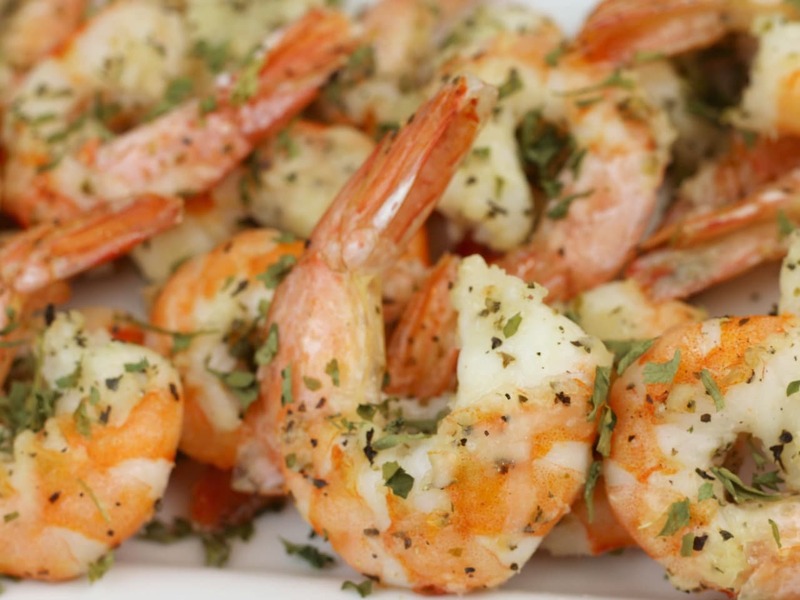 Serving shrimp is always a big hit at parties. I mean everyone loves shrimp right? However, it can become expensive if you’re feeding a big crowd. By cutting up shrimp and using it to make this dip I was able to create an elegant and impressive appetizer with out breaking my budget. 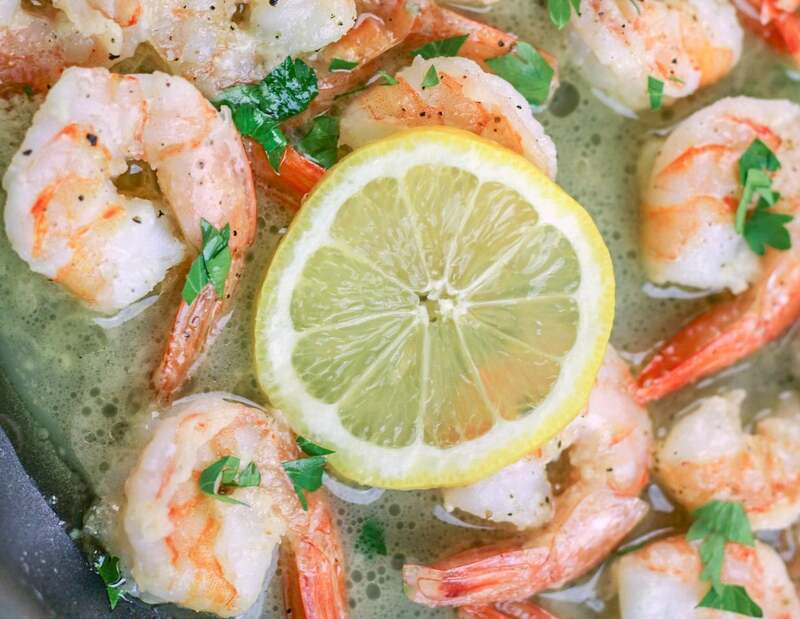 To make this dip you will need to defrost a pound of peeled deveined shrimp. 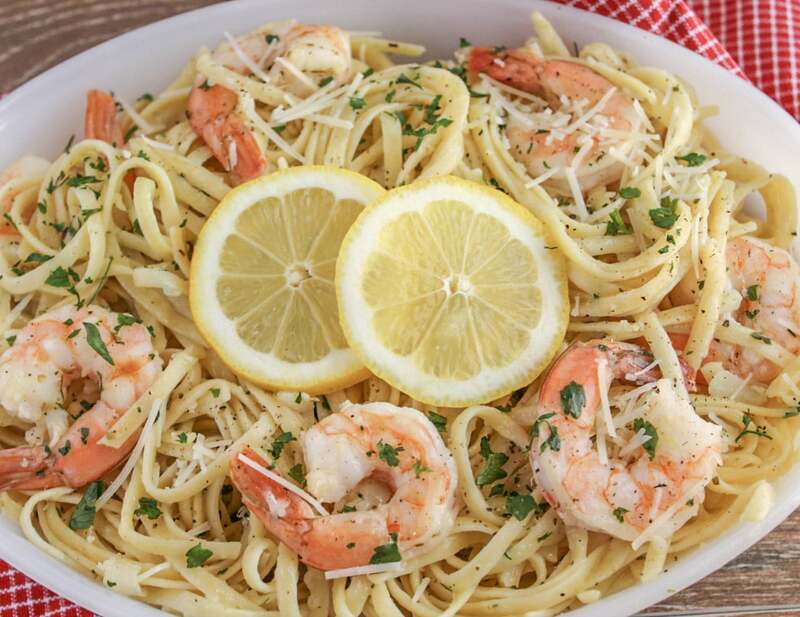 To do this I simply placed the frozen shrimp in a colander under warm water for a few minutes. Once the shrimp is thawed I pat it dry with a paper towel to eliminate any extra moisture so the shrimp doesn’t become rubbery when cooked. 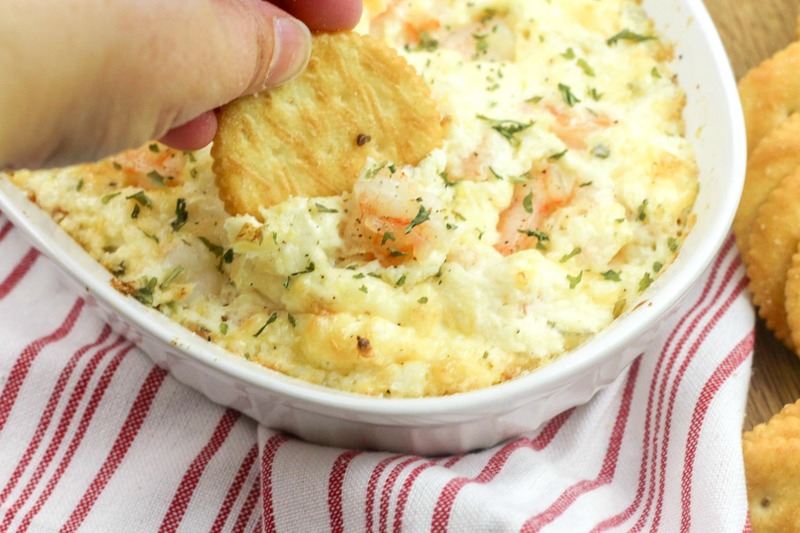 To make this shrimp dip begin by heating olive oil in a skillet over medium high heat. Then add the shrimp into the hot skillet and cook until shrimp firm and pink. Once the shrimp are cooked set them aside cool. Once cooked chop the shrimp into small pieces. Next, in a medium bowl mix cream cheese, mayonnaise, mozzarella, parmesan, mozzarella, garlic and parsley together. Cut the tails off the cooled shrimp and discard. Then, add the chopped shrimp into cream cheese mixture and combine. Finally, transfer to a small baking dish and bake for 30 minutes or until golden brown and bubbly. This recipe will make about 12 servings so it’s perfect for a small gathering. If you are feeding a big group double the ingredients and bake in a shallow dish like a pie plate. Looking for more great appetizers? 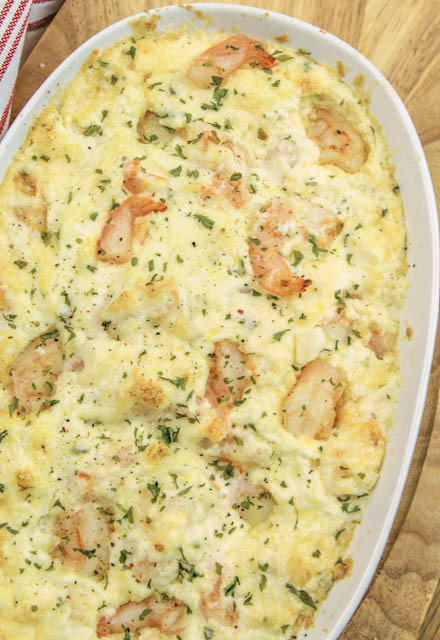 This recipe for Baked Shrimp Dip will make you the hero of the party. Made with savory shrimp and tons of delicious gooey cheese this recipe is always a crown pleaser! 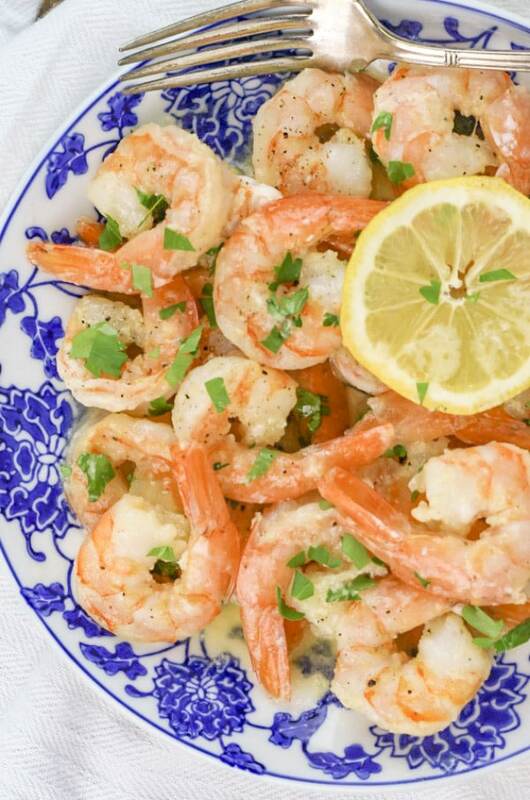 Add garlic and shrimp to skillet and season with salt and pepper cook shrimp for 3 to 5 minutes or until firm and pink. Then set the shrimp aside to cool the chop into small pieces. In a large bowl, mix together lemon juice and zest, mayonnaise, mozzarella, parmesan, and parsley. Stir in chopped shrimp and season with more salt and pepper. 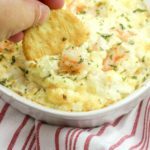 I just pinned your delicious Baked Shrimp Dip! Hope you are having a great day and thanks so much for sharing your awesome post with us at Full Plate Thursday.